A rendering of the Center complex shows a proposed promenade along the Lagoon, with a view of the museum building and, at a distance, the Museum of Science and Industry. The Obama Foundation released updated plans for the Obama Presidential Center to the media on Wednesday, the same day it filed those plans before the Chicago Plan Commission. The plans incorporate criticisms by members of the South Side community, including the relocated parking garage. In its statement accompanying the plans, the Foundation also responds to national concerns about the Center’s potential to disrupt Jackson Park’s role as a natural enclave and historic site. The Center’s three main structures would consist of a central museum building; a forum building containing public-use spaces, an auditorium, and a restaurant; and a library building that may hold a branch of the Chicago Public Library, according to the Foundation plans. The buildings will partially surround a public plaza, meant to serve as an informal gathering point, an events venue, and a primary entrance to the Center. The museum building, depicted since early designs of the site as a large tower, has been narrowed and made taller in response to criticisms that it appeared uninviting. The tower will be 225 feet tall, as opposed to the original 160–180 foot estimate. The tower has also gained a large glass section on the northern facade, as well as sections of the walls made up of large stone letters, the gaps between which would allow additional light into the building. The museum will feature exhibits related to the Obamas, African American history, Chicago history, and American history more broadly. Access to the museum exhibits will require tickets, but the top floor and other areas will be open to the public. An athletic center with a multipurpose sports area will be sunk partially below the surface of the site, in the southwest corner of the site. The tops of all the Center’s buildings, except the museum tower, will be landscaped and open to the public. The designers say the landscaped roofs will help to compensate for the lost park space, in addition to the closing of Cornell Drive between 60th and 67th Streets. Critics continue to argue that closing Cornell Drive, a busy six-lane highway that runs next to the Jackson Park Lagoon, will worsen traffic and cost taxpayers large sums. 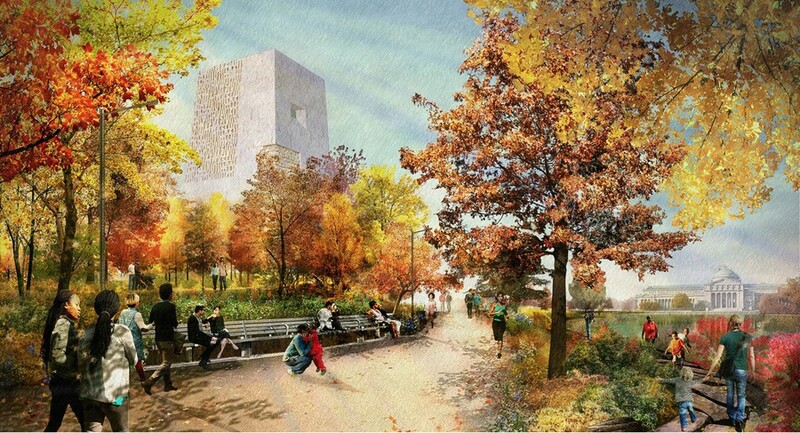 The Foundation argues that replacing Cornell Drive with a strip of parkland will connect the Center to the Museum of Science and Industry and increase the overall amount of parkland by 5.16 acres, more than the 3.6 acre footprint of the Center’s buildings. This claim has been contested, including by Charles Birnbaum, President and CEO of The Cultural Landscape Foundation. The statement also emphasizes that changes including the decision to build the Center’s parking garage underground rather than on the east end of the Midway are meant to better maintain Frederick Law Olmstead and his partner Calvert Vaux’s original design for the parks. The surrounding grounds would be made up of landscaped areas, including a sledding hill and dispersed areas meant for local residents and children to use. The Jackson Park Women’s Garden, which would have originally seen the addition of a large reflecting pool, will be kept in its current state. Critics had called for it to be preserved as is. The plans estimate that the center will have a total economic impact of $3.1 billion over its first 10 years. The Foundation also submitted its plans to the Chicago Plan Commission on Wednesday, according to its plan to obtain approval by spring and break ground before the end of the year. The center still faces major reviews, including a National Register of Historic Places investigation of the Center’s potential impact on Jackson Park that is not expected to conclude until fall. Foundation leaders told The Tribune that they still hope begin construction by the end of 2018, on schedule to open the Center’s doors by 2021.